Want to stay updated on time your computer has been up and running? 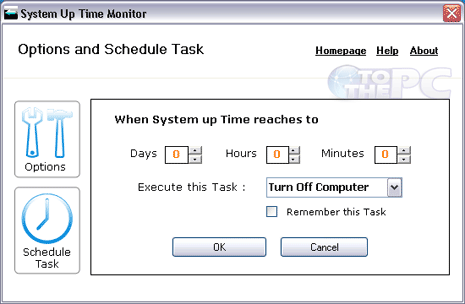 SUTM (System Uptime Monitor) is small utility that show computer uptime (in days, hours, minutes, seconds) on the desktop screen. It shows this information in stylish and cool looking blue dialog box. It also show date and time at which system was started. Besides basic uptime date and time information, you can also use this program to configure system to shutdown, logOff, hibernate at specific time. Click Schedule Task button to see options for the same (as seen in screenshot below). Select days, hours, minutes and then select task that should execute at selected time among: turnOFF, logOFF, hibernate, restart, alert, run specific program or file. One handy and nice looking program to stay updated with system uptime. Download SUTM, it is all free for download and use on Windows Vista, XP and 2000.